Charlotte of Savoy (c. 1441/3 – 1 December 1483) was queen of France as the second spouse of Louis XI. She served as regent during the king's absence in 1465, and was a member of the royal regency council during her son's minority in 1483. She was a daughter of Louis, Duke of Savoy and Anne of Cyprus. Her maternal grandparents were Janus of Cyprus and Charlotte de Bourbon-La Marche. Her maternal grandmother, for whom she was probably named, was a daughter of John I, Count of La Marche, and Catherine de Vendôme. She was one of 19 children, 14 of whom survived infancy. On 11 March 1443, when Charlotte was just over a year old, she was betrothed to Frederick of Saxony (28 August 1439- 23 December 1451), eldest son of Frederick II, Elector of Saxony. For reasons unknown, the betrothal was annulled. Less than eight years later on 14 February 1451, Charlotte married Louis, Dauphin of France (future Louis XI), eldest son of Charles VII of France and Marie of Anjou. The bride was nine years old and the groom twenty-seven. The marriage, which had taken place without the consent of the French king, was Louis' second; his first spouse, Margaret of Scotland, had died childless in 1445. Upon her marriage, Charlotte became Dauphine of France. Louis reportedly neglected her. When the news upon his succession to the throne of France reached the couple at the Burgundian court, he immediately abandoned her in Burgundy to secure his inheritance, leaving her dependent upon Isabella of Bourbon to borrow the carts and entourage necessary to travel to France to join him. On 22 July 1461, Charlotte became Queen of France. The following year, she became seriously ill and was close to death by August 1462. Although she recovered, her health was weakened. Louis XI did not keep much of a representational court life. He had Queen Charlotte and her household kept secluded at the Château of Amboise, where she spent her days with her sisters and courtiers, supervising the education of her daughters (her son was educated by the king), playing chess and marbles, listening to her lute player, doing needlework and fulfilling her religious duties. On rare occasions she was asked to fulfill ceremonial tasks as queen such as greeting foreign guests, for example in 1470, when the king took the powerful Earl of Warwick and the Duke of Clarence from England to Amboise to visit her. Charlotte was interested in literature and praised for the taste and excellence of her personal library. She left a collection of about one hundred manuscripts, which would become the genesis of the Bibliothèque nationale of France. Charlotte was regarded as virtuous. A contemporary noted that "while she was an excellent Princess in other respects, she was not a person in whom a man could take any great delight"; However, after the birth of her last child in 1472, Louis swore that he would no longer be unfaithful, and according to the chronicler Phillip de Commynes, he kept this vow. Charlotte served as regent in September 1465. Charlotte was widowed on August 30, 1483, upon which Louis XI was succeeded by their son Charles VIII, who was still a minor. Louis XI did not make Charlotte regent if his son should succeed him while still a minor; he did in fact not formally appoint a regent at all, but he did leave instructions for a royal council to govern during such a minority, in which Charlotte, alongside Duke Jean de Bourbon II and their two sons-in-law Louis d'Orleans (married to their daughter Jeanne) and Peter II, Duke of Bourbon (married to their daughter Anne), were made members. In practice, her daughter Anne took control over France as regent during the minority of Charles. Charlotte died on 1 December 1483 in Amboise, just a few months after her spouse's death. She is buried with him in the Notre-Dame de Cléry Basilica  in Cléry-Saint-André (Loiret) in the arrondissement of Orléans. Charlotte became the mother of eight children, but only three survived infancy. These were Charles VIII, who became king of France, Anne, who acted as regent of France for Charles, and Joan, who became queen of France as the spouse of Louis XII. Anne (3 April 1461 – 14 November 1522), Duchess of Bourbon, Viscountess of Thouars (1468–1473), Regent of France (1483–1491); married Peter II, Duke of Bourbon, by whom she had one daughter, Suzanne, Duchess of Bourbon. Charles VIII (30 June 1470 – 7 April 1498), who married Anne of Brittany; he died childless. Upon the death of her daughter, Anne, Charlotte's line became extinct; her granddaughter, Suzanne having died in 1521 without surviving issue. ^ a b Joachim W. Stieber, Pope Eugenius IV, the Council of Basel and the Secular and Ecclesiastical Authorities in the Empire, (E.J. Brill, 1978), 254. ^ a b Richard Vaughan, Philip the Good, (The Boydell Press, 2010), 353. Maria Karolina Zofia Felicja Leszczyńska, also known as Marie Leczinska, was a Polish noblewoman and French Queen consort. The daughter of King Stanisław Leszczyński—Stanislaw I of Poland –and Catherine Opalińska, she married King Louis XV of France and became queen consort of France. She served in that role for 42 years from 1725 until her death in 1768, the longest service of any queen of France, and was popular due to her generosity and piety. 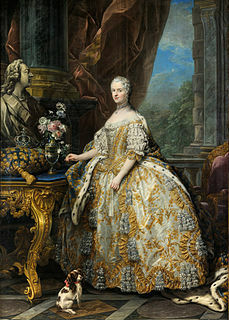 She was the grandmother of Louis XVI, Louis XVIII and Charles X of France. René II was Count of Vaudémont from 1470, Duke of Lorraine from 1473, and Duke of Bar from 1483 to 1508. He claimed the crown of the Kingdom of Naples and the County of Provence as the Duke of Calabria 1480–1493 and as King of Naples and Jerusalem 1493–1508. He succeeded his uncle John of Vaudémont as Count of Harcourt in 1473, exchanging it for the county of Aumale in 1495. He succeeded as Count of Guise in 1504. Gilbert de Bourbon, Count of Montpensier was the son of Louis de Bourbon and Gabrielle La Tour, Count of Montpensier and Dauphin d'Auvergne. He was appointed to the Order of Saint Michael by Charles VIII in October 1483. Marie of Anjou was Queen of France as the spouse of King Charles VII from 1422 to 1461. She served as regent and presided over the council of state several times during the absence of the king. Anne of France was a French princess and regent, the eldest daughter of Louis XI by Charlotte of Savoy. Anne was the sister of Charles VIII, for whom she acted as regent during his minority from 1483 until 1491. During the regency she was one of the most powerful women of late fifteenth-century Europe, and was referred to as "Madame la Grande". Between 1503 and 1521, she also acted as de facto regent of the Duchy of Bourbon during the reign of her daughter Suzanne, Duchess of Bourbon. Jacqueline de Longwy, Countess of Bar-sur-Seine, Duchess of Montpensier, Dauphine of Auvergne was a French noblewoman, and a half-niece of King Francis I of France. She was the first wife of Louis III de Bourbon, Duke of Montpensier, and the mother of his six children. She had the office of Première dame d'honneur to the queen dowager regent of France, Catherine de' Medici, from 1560 until 1561. Anne Charlotte of Lorraine was the Abbess of Remiremont and Mons. She was the thirteenth of fifteen children of Leopold, Duke of Lorraine, and his spouse Élisabeth Charlotte d'Orléans. Her mother was the niece of Louis XIV of France and sister of Philippe II, Duke of Orléans and Regent of France during the minority of Louis XV.